This is the ultimate of pie safes, the most desired, the most sought after, the home run of Southern food safes. From the now classic article in the Magazine Antiques by Roddy Moore, to the acclaim online by Ken Farmer, and to the soon to be released book on Southern pie safes by Jeff Evans, this is the cream of the crop. The Moore article was published in the September 1984 issue on pages 602 613, providing us all with scholarly information on the Rich Brothers shop in Wytheville. Jeff Evans book appears to be set to be released any day. There are quite a few images of similar pie safes available for review. 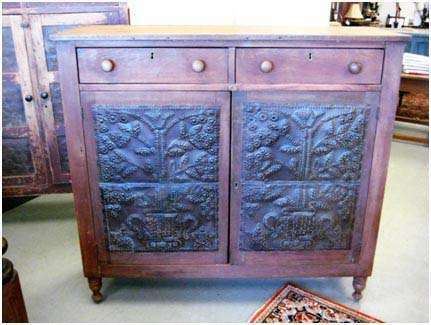 The basic architecture of Wythe County pie safes is very similar to each other, and the punched tins with a tulip, leafage, and urn design are also often repeated. These tins are original and the painted surface is also original with expectable wear and losses.